Oscar-winner Marion Cotillard (Ma vie en rose), Mathieu Almaric (The Diving Bell and the Butterfly) and Charlotte Gainsbourg (Antichrist) team up for the latest feature from acclaimed writer-director Arnaud Desplechin (A Christmas Tale). Filmmaker Ismael (Almaric) lives with his wife Sylvia (Gainsbourg) but remains obsessed with his ex-wife (Cotillard), who disappeared 20 years ago and is believed to be dead. When she suddenly reappears, Ismael’s life – already complicated by a film project he is unable to finish – takes a strange turn. 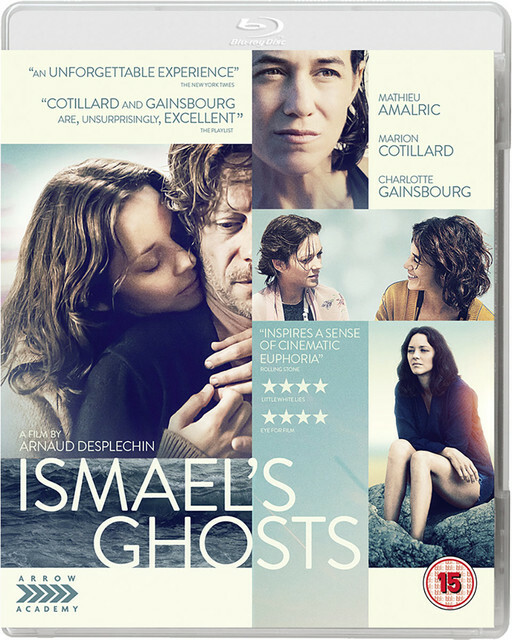 Complex, playful and humorous, Ismael’s Ghosts is a wonderful showcase for some of French cinema’s finest acting talent. Arnaud Desplechin's Ismael's Ghosts will be released as part of the Arrow Academy line next year. Among the extras will be a brand new anamorphic transfer and a chapter list, I'm sure. Don't forget the original 5.1 track and the trailer. Any joke aside, the minimum would be to include the 2 cuts of the movie to begin with. Agree. It's ridiculous how hard-to-acquire his films have become. It might be difficult to do that, at least with the more well known Desplechin films, as in the UK Ma vie sexuelle is out from Pathé, Kings & Queen is out from Artificial Eye and A Christmas Tale from New Wave Films! They're all on DVD though, so could benefit from the Blu-ray upgrade. Ma vie sexuelle is in 4:3 letterbox, and needs a uppgrade, especially when the "second part", Trois souvenirs de ma jeunesse, someday gets a Blu-Ray release. Jimmy P. (Blu-ray) you can buy from Amazon.de. It's has the original English soundtrack. I think My Golden Days is with New Wave too but there still doesn't appear to be a release date in prospect. The same is the case with Jia Zhangke's Mountains May Depart. This will not be the movie to win over any Desplchin skeptics, but I loved this, though I could not tell you what its purpose was. As a "sequel" to Rois et reine, it adds nothing to and builds nothing on the first. Like all Desplechin movies, it is an exhilarating and sometimes exhausting collection of overstuffed moments and narratives winding in and out of each other. There are colorfully unlikable and complicated characters. There's a constant novelty in approach and form. And yes, there's yet another dance scene (and it is one of the weirdest moments I will have watching movies this year, as Marion Cotillard enthusiastically shimmies to an utterly undanceable Bob Dylan song while Charlotte Gainsbourg looks on in polite confusion). Special shout outs to two of the actors here: the legendary László Szabó steals the movie as an aging political director who in one of the best scenes in the film gets into a completely unnecessary yet beautifully cathartic altercation on the flight to his rep screening-- it's a lovely and unexpected exploration of impotence in all senses of the word; and Louis Garrel, who between this and Le Redoutable has unexpectedly won me over as a comic actor. Every review I've read of this short-shrifts the amount of screentime the spy portions with Garrel receive, but in reality a full third of the film is given over to these extended bits of inspired comic explorations of "lack"-- no easy notes are hit as we follow a character who is not very good at his job, not particularly invested, and yet inexplicably connected for reasons that become clear once we understand his function within the larger picture. These scenes are long, amusing, and unexpected in the routes they take as Desplechin avoids nearly every easy gag or approach, instead arriving on a peculiar comic tone that I'd love to see more of in a future Desplechin vehicle-- though given the toxic response this film received, it probably won't happen! No details as to which / how many cut(s) will be included, nor the extras. Just like Aquarius, I will be reversing the cover art. The latest from from Arnaud Desplechin starring Mathieu Amalric and Mariion Cotillard. 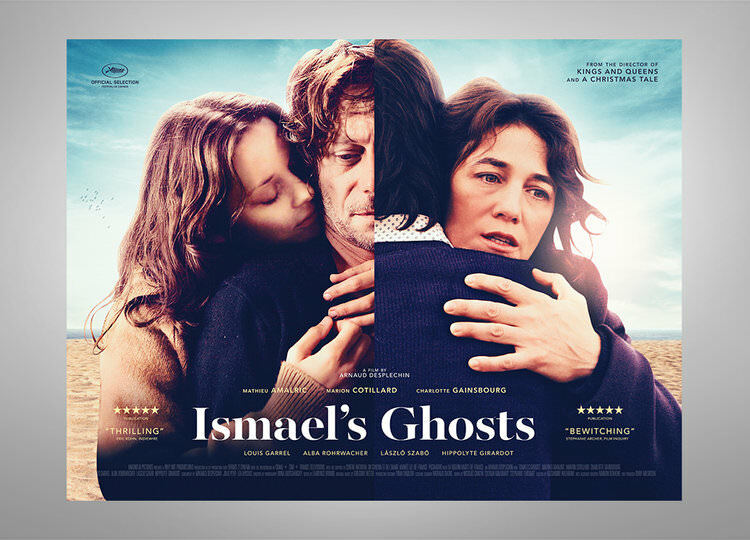 The opening film of the prestigious Cannes Film Festival in 2017, Ismael’s Ghosts is the latest film from celebrated filmmaker Arnaud Desplechin (My Golden Days, Kings and Queen). Telling the story of Ismael, Mathieu Amalric (The Grand Budapest Hotel, Casino Royale, in his sixth collaboration with Desplechin), a filmmaker preparing to direct his new film has his life turned upside down when his wife (Marion Cotillard, Rust and Bone, Macbeth), who has been missing and presumed dead for twenty years, mysteriously comes back into his life. His girlfriend, Charlotte Gainsbourg (Melancholia, Antichrist) attempts to help Ismael retain his sanity as his personal and professional life spins out of control. 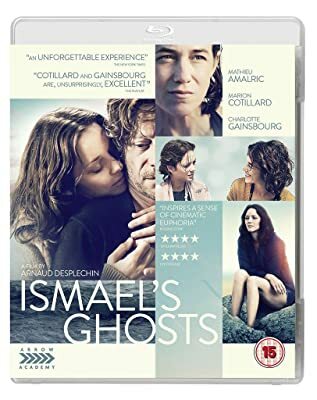 Featuring some of the finest actors working in France today and an incredible supporting cast including Louis Garrel (The Dreamers), Alba Rohrwacher (I Am Love) and László Szabó (The Unbearable Lightness of Being) Ismael’s Ghosts is a stunning showcase for these incredible performers. The shorter cut is the one used as reference for the product, so I'm unsure which one is exclusive to the LE. I've been told that the shorter cut should be avoided (it hasn't even been released in France on video, and I believe has only been shown theatrically at Cannes), so I hope the longer cut will be the preferred one in the release. Not in the age to internet in such a labirent!! At least I only ever really have to see the spine? Anyone who's seen both cuts can tell me which one to watch, and if I should give both cuts a watch? I haven't seen the shorter version, but I can't imagine cutting anything from the longer version, so I have no desire to sit through it. Windy, long narrative messes are Desplechin's raison d'etre, why watch a truncated version?